A breakfast-time barrel bomb killed up to 20 civilians in the Shaar Market area of Aleppo in July. Demotix / Jacob Simkin. All rights reserved. Late in the evening of 1 September, an Iraqi air force plane dropped a bomb on a school in Alam, near Tikrit, which had recently fallen under the control of Islamic State (IS). Dozens of displaced families were sheltering there. The immense explosion and flying shrapnel killed at least 31 civilians, including 24 children, and wounded 41 others. One survivor told us he had lost his wife, two sons, a daughter, a sister and a nephew. Five members of his family were also wounded, including his son Yazin, just six months. Modern and not-so-modern armies rely on explosive weapons—aircraft bombs, mortars, artillery, rockets and even ballistic missiles—to conduct military operations, not just ubiquitous assault rifles and machine guns. When civilians are killed or wounded in fighting in populated areas, it is usually these weapons which inflict the harm. In 2014 alone, Human Rights Watch (HRW) documented the use of explosive weapons in populated areas, in violation of international humanitarian law (the laws of war), in at least 12 countries: Syria, Iraq, Israel/Gaza, Ukraine, Libya, Pakistan, Afghanistan, Sudan, Nigeria, Somalia, Thailand and Colombia. Such unlawful attacks were typically indiscriminate (they did not distinguish between the military target and civilians) and/or disproportionate (the anticipated civilian loss exceeded the expected military gain). Ranging from cheap and easy to produce to complex and expensive, explosive weapons are often deadly to anyone in the vicinity. According to Action on Armed Violence, a UK-based non-governmental organisation, they maimed and killed almost 38,000 people in 2013—82% of them civilians. Not surprisingly, when more civilians are present, that proportion jumps—to 93% in populated areas. 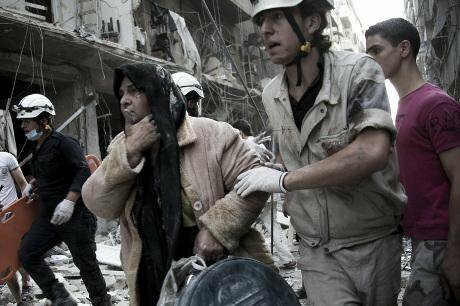 In Syria, explosive weapons have been responsible for most of the civilian deaths (about 40,000 of more than 75,000) documented by the Violations Documentation Center, a Syrian-based monitoring group, since the conflict erupted there in 2011. Not all uses of explosive weapons in populated areas violate international humanitarian law. But growing urban warfare and rapidly mounting civilian casualties around the world scream for urgent action. For several years, international momentum has been building to curtail the use of explosive weapons in populated areas, including halting the use of those with wide-area effects. Doing so would help save lives, alleviate civilian suffering and reduce destruction of civilian infrastructure, which would facilitate post-conflict recovery. It could be the single most crucial step states could take to protect civilians from the horrors of war. When explosive weapons detonate, they emit a destructive blast wave which travels faster than sound. Often, however, the most lethal effects are caused by flying fragments of casing—shrapnel—which can have a long reach. The Syrian government’s OFAB 250-270 aircraft bomb, for example, can inflict damage and injuries within a 155-metre radius. The casing can also be designed to shatter into sharp pieces, which can penetrate the body and rip internal organs. The wide-area effect of some explosive weapons is a key reason why they kill and injure so many civilians. Many are also unguided or used without spotters, which means they cannot be targeted precisely, posing additional civilian risk. A doctor at a morgue in eastern Ukraine said 99% of the civilian war victims it had received had died of fragmentation injuries caused by explosive weapons. In Syria, mortars, artillery, rockets, fuel-air explosives and ballistic missiles carrying explosive have all been deployed in populated areas. Since late 2013, the government has also increasingly used ‘barrel bombs’. Built locally from oil drums, gas cylinders and water tanks, they are packed with a deadly cargo of high explosives, oil and chemicals—with scrap metal to enhance fragmentation on impact. In 2014, HRW documented hundreds of irregularly-shaped blast craters in Aleppo caused by such bombs and recorded dozens of injuries and fatalities. These included Noura al-Abdu (13), decapitated in Hraytan, north-west of Aleppo, in a December 2013 barrel-bomb attack which also severed the leg of a nine-year-old girl as she sought shelter from a helicopter. Armed groups opposed to the Syrian government have also fired mortar and artillery shells and launched rockets into populated, government-controlled areas, and their powerful car bombs have killed hundreds of civilians. A twin bomb attack targeting a school in Homs on 1 October reportedly killed dozens of children and several adults. On 29 April, two mortar shells also struck the Badr el-Din Hussaini educational complex in the Shaghour neighborhood of Damascus, a pro-government area, killing 17 children and at least two parents and injuring 50 others. In Iraq, IS has earned a reputation for limitless cruelty by shooting and beheading hundreds of non-combatants. But it has also fired mortar shells into populated areas, killing and maiming civilians, and its car bombs across the country have killed hundreds more, likely amounting to crimes against humanity. The government’s response has included barrel bombs and a string of indiscriminate attacks. In Gaza, Israeli forces fired tens of thousands of explosive weapons into populated areas where Hamas was deployed during seven weeks of war in July and August. Hamas fired thousands of rockets and mortars toward Israeli population centres. Israeli attacks killed more than 2,100 Palestinians, including at least 1,486 civilians, according to the United Nations. Daily casualty reports from local human-rights organizations in Gaza show that nearly all the deaths were from explosive weapons. In Ukraine, government forces have fired artillery, multiple-launch Grad rockets and other explosive weapons into populated areas where pro-Russian rebels were deployed, killing dozens and injuring many more. The pro-Russian forces have used the same kinds of weapons against government forces, also killing and injuring civilians. In Sudan, persistent government bombing of populated areas in the Nuba Mountains (South Kordofan) and Blue Nile has killed and maimed hundreds of civilians and damaged humanitarian-aid structures since the conflict started in 2011. A surge in bombing in May and June forced Médecins Sans Frontières to withdraw. Using explosive weapons in populated areas not only causes civilian casualties but also destroys infrastructure—schools, hospitals, water pipes, electrical grids—prolonging the impact of armed conflict. When government and rebel forces were firing unguided rockets, artillery and other explosive weapons at each other in Luhansk, eastern Ukraine, for weeks tens of thousands trapped in the city were left without running water and electricity. When a researcher visited in late August, hundreds were braving regular bombardment to line up for hours at dawn for water and food at distribution points across the city. Israeli explosive weapons destroyed or damaged more than 15,000 buildings in Gaza during the summer’s conflict, according to satellite-imagery analysis by the United Nations Institute for Training and Research. Schools were particularly affected: 228 were damaged, according to a UN special rapporteur. When the school year began in September, 90% of Gaza’s schools were on a double shift, with students attending for just four hours each day. Views appear to be coalescing around two notions: that the most feasible outcome is likely to be a politically binding commitment—such as a joint declaration of guidelines—rather than a new legal instrument, and that there should be a focus on explosive weapons with wide-area effects. In northern Syria, government air strikes, some seemingly deliberate, have damaged and destroyed hospitals, leaving the medical system in a shambles. Physicians for Human Rights, which documents the plight of medical personnel, has recorded nearly 200 attacks on hospitals since the start of the conflict. The few medical resources available are insufficient to cope with war-related injuries, while maternal health, vaccinations, burns and chronic diseases are neglected. In northern and eastern Syria, the collapse of the medical system contributed to the outbreak of polio, not seen in the country since 1999. The use of explosive weapons in populated areas is also one of the main causes of displacement of civilians. Most people we interviewed in refugee camps in Turkey, Jordan and Lebanon said they had fled Syria because of the government’s constant bombardment of areas held by non-state armed groups. People fleeing Luhansk in Ukraine said the same. International law prohibits the use of certain explosive weapons, notably anti-personnel landmines and cluster munitions. But, for the most part, the legality of explosive-weapon use is determined case by case from general provisions in international humanitarian law—such as the obligation to conduct attacks using weapons in a manner that can distinguish between civilians and combatants or other military objectives. This piecemeal analysis does not lend itself to a categorical finding regarding a broad category of weapons (eg explosive weapons) in a general type of setting (eg populated areas). As a result, it cannot set a clear boundary on the issue. So what can be done? A legally binding ban on the use of all explosive weapons in populated areas would not be politically feasible, but it is possible to set standards that would significantly raise the bar. HRW is a founding member of the International Network on Explosive Weapons (INEW), a global coalition established in 2011. INEW calls on governments to “develop stronger international standards, including certain prohibitions and restrictions on the use of explosive weapons in populated areas”. Building these standards will take time. But states and other actors should acknowledge the problem in international discussions and review national policies that outline what weapons are appropriate for use in populated areas and under what circumstances. They should seek to develop a common position that aims to limit further the use of explosive weapons in populated areas. In particular, they should agree to halt the use of explosive weapons with wide effects in populated areas and military commanders should not order their use in such circumstances, due to the foreseeable harm to civilians. Emphasising explosive weapons with wide-area effects is crucial because they have caused the most civilian harm. The concept needs to be more precisely defined but it should include heavy weapons that generate a wide blast and/or fragmentation radius (like large aircraft bombs), weapons with multiple munitions or explosive warheads that cover a large area (like Grads and other multiple-launch rocket systems) and weapons that are so inaccurate they cannot be effectively targeted (like barrel bombs). Other measures could be considered which could go beyond the minimum requirements of international humanitarian law. Possibilities discussed include restricting the use of indirect-fire weapons or unguided weapons in populated areas and committing to using the least destructive force to achieve a military advantage. States could articulate best practices related to doctrine, operational policies, planning directives, rules of engagement and other such topics. Despite the increasing use of explosive weapons in populated areas in 2014, the year also saw significant international efforts to address the issue—and momentum is likely to grow. The UN secretary-general, several UN agencies (notably the Office for the Co-ordination of Humanitarian Affairs or OCHA) and the International Committee of the Red Cross (ICRC) have all called on states to refrain from using explosive weapons with wide effect in populated areas. In March, the ICRC held a meeting to consider how to strengthen the protection of civilians from explosive weapons used in populated areas. In June, Norway hosted an informal experts meeting with OCHA with the same purpose. Austria has announced it will host a follow-up meeting in 2015. A sustained international process is getting under way. Views appear to be coalescing around two notions: that the most feasible outcome is likely to be a politically binding commitment—such as a joint declaration of guidelines—rather than a new legal instrument, and that there should be a focus on explosive weapons with wide-area effects. Some government and military experts have expressed concern about the growing effort to curb explosive-weapon use in populated areas, on two grounds: many governments already do this through domestic policies and regulations, and the most serious violators will not comply with international guidelines since they already violate other standards with impunity. Non-binding guidelines might not have an immediate effect on the Assads of this world but the power of international norm-setting should not be underestimated. Today, few countries—even those which have not signed the relevant treaties—are comfortable admitting they use landmines or cluster bombs. And the fact that many countries already restrict the use of explosive weapons in populated areas is an argument for, not against, developing international guidelines, which would help spread the practice. Other critics have speculated that limiting the use of explosive weapons in populated areas would encourage opposition forces to move into cities and towns and prevent civilians from leaving—all to deter belligerent forces from attacking with explosive weapons. But such actions, which would amount to using human shields or otherwise deliberately putting civilians at risk, are already prohibited under international humanitarian law and could alienate the civilian population. A future political declaration on the use of explosive weapons in populated areas should affirm the obligation to avoid co-location of military objectives and civilians. But it should not be aimed at preventing the use of appropriate means and methods of warfare to address such a situation, and it could help to elaborate what those means and methods might be. Explosive weapons kill and injure thousands of civilians every year and seriously damage civilian infrastructure. Clear international guidelines on their use in populated areas could have prevented the 31 deaths of civilians at the Tikrit school, as well as countless deaths, injuries and suffering in other places. Curbing their use would have a bigger impact than anything else on the protection of civilians during armed conflict.